Festival in Nepal means faith in God, feelings for family and fun with friends. 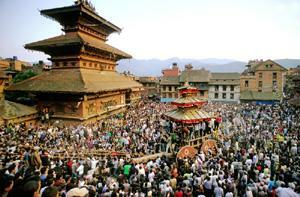 Nepal is land of festivals with rich cultural heritage. Yet religion has always been the central core of the Nepali culture. This is one of the main reasons why everything ceremonial in Nepal always begins with something religious and moves with the spontaneous social spirit and eventually ends up with the friendly feast and fun for all. This is what the celebration of any festival means to the Nepalese people.This has long been the Nepalese way of life probably from the time immemorial. It is quite interesting to note that more than 90% of the Nepalese festivals have religious origin. During the celebration of any festival in this country,the cultural activities such as dancing and singing,repeating lore and legends and preforming ceremonial,rites and rituals and so on are the most fascinating phenomena.The Nepalese people have lore and legends always ready on the trip of their tongues,beliefs in God always warm in their blood,feelings for their friends and family in their heart and of course pure Himalayan smiles of the new comers all over Nepal. Nepalese people have great respect for Nagapanchami Day, which falls every ear on the fifth day of bring fortnight of Shrawan (July - August). They celebrate if by posting colorful portraits of Nagas (Serpents)on the walls above the mail doorways. Nagapanchami has a very ancient origin.The tradition of serpent-worship seems to have originated from Teh Dravidian culture. So, this tradition is in its basic form very non-Vedic. Then Aryans did not initially worship the snakes. They were always afraid of the snakes and tried by all means to keep them away. The Vedas have very little to say in praise of serpent-gods(There is a reference about an interesting method of neutralizing snake venom in the Rigveda.Thittiriya Samhita prescribes snake sacrifice for one\'s peace, protection and prosperity.) It was only in the Puranic period that the Aryans made some rooms for the snakes in their religious functions. But later,the Puranas started speaking very highly of significance of the serpent-worship. And thus the tradition of serpent-worship came to be recognized as an integral part of the Vedic religion. Janai Purnima falls on the full moon day of Shrawan (July - August). Celebrated by the entire population of Nepal, Hindus and Buddhist, this festival is variously known as Gunhipunhi and Kwantipunhi, Rishitarpani,etc. On this day one can see several Hindus going to the Buddhist temples and vice versa. The Brahmins and Chhetris wear a new Janai across their shoulders on this occasion. It is a sacred three-stringed thread symbolizing the three basic qualities of nature: Sattwik(creative), Rajasik (preservative) and Tamasik (Destrucive). The custom of changing sacred thread every symbolizes the purification of one\'s body and mind. Hundreds of pious people throng to different places of pilgrimages and take the bath or dip in the holy rivers and sacred lakes and purify themselves. Festivals,feasting and fun have always been an integral part of Nepalese life. And nowhere is this better highlighted then in the moth of Shrawan 9 July - August) when over eight different festivals take place. The most fascinating one in the series in Gaijatra, or the \'Festival of Holy Cows\'. It falls exactly on the first day of the dark fortnight. The festival is marked with the parade of the people wearing bead-dress with portrait of the cow pinned up on them. Such dress is said to represent the holy cows on their way to heaven. Gaijatra in Kathmandu starts from Hanuman Dhoka whereas in Patan and Bhadgaon it starts from their respective Durbar Squares. The parade lasts from dawn to dusk. However, the masquerading,except the ritual representation of the cow,lasts for the whole week. Another attractions of this festival is colorful masquerades.On this day,lots of people, dressed up in the oddest possible attires, go round the city. Some of them are clad only in rags and others in straw and hay to look funny. Many of these paraders have their face painted like devil. According to a Hindu tradition, they are all regarded to represent the ghostly spirits lost and wandering around on their way to the world of the dead. There is perhaps no deity like Lord Krishna in the entire Hindu pantheon who has been so highly honored by millions of his devotees including great Rishis (seers), brave kings and simple souls. Krishna, considered as an incarnation of Lord Vishnu,the Hindu deity of preservation,has a large following in Nepal. His visage is depicted in blue,the traditional color of Vishnu. His being blue is said to remind his devotees that he is all-pervading and ever-fascinating like the brilliant blue sky. Krishna is also generally regarded as a great god of love and romance. It is said that thousands and thousands of Gopinis (girl-cowhands) were enamored by the beauty of his bright blue body and lured by the sweet melody of his Murali (flute). The Indrajatra festival begins only when a forty eight foot long,gigantic pole,or lingo is erected amidst a very old-styled religious function attended by the government priests and officials in a huge public gathering the Hanuman Dhoka (Kathmandu Durbar Square) in Kathmandu city. 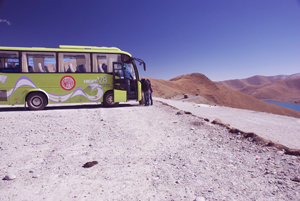 The pole is also regarded as the victor banner of Indra,the king of heaven. This auspicious day falls on the twelfth day of the bring fortnight of Ashwin (September - October). This fascinating festival lasts for eight days and is celebrated by the entire Hindu and Buddhist people in form or another throughout the country.